Netflix issued a warning to people doing the #birdboxchallenge. But these restaurants don't care. Restaurants and amateur chefs are taking the idea of a "blind date" to a whole new level. Fueled by yet another bizarre internet sensation, eateries are hosting events where patrons will not be able to see their dinner companions — or anything else in the restaurant, for that matter. 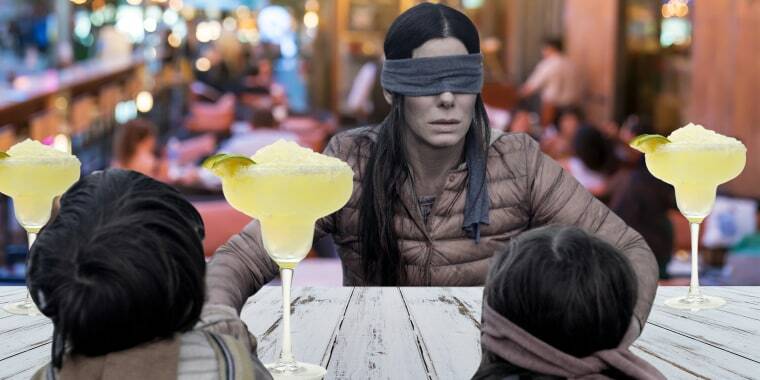 "Bird Box," starring Sandra Bullock, the award-winning actress, mother and not-so-experienced chef, was an instant hit when it premiered on Netflix in December. And although the thriller was harrowing (with Bullock's character leading children through post-apocalyptic mayhem), it ignited a viral challenge that has seen people actually risking their lives — or least serious injury — just to share their experiences with the world. The #birdboxchallenge swept through social media with people participating in all sorts of activities from walking to cooking and even driving. Now, restauranteurs are taking on the challenge, with some charging quite a bit for the sensory deprived experience. The first dinner — if you can call it that — happens Friday night at an upscale, historical establishment in Jericho, New York. The Milleridge Inn's "complete sensory experience" includes two seatings (one at 6 p.m. and one at 8 p.m.), both of which will include a three-course dinner for $48 per person, plus tax. Every diner will be blindfolded throughout the entire meal. But that's not all. The kicker? Diners are also being asked to remain completely silent with only the sound of birds chirping and water to guide them through the meal. OK, so that is a little harrowing. On the lighter side of horrifying spoofs, the Atlanta-based Guac y Margys has invited patrons to get into the Patron spirit with their eyes covered on Jan. 24. Tickets to the event, which run from $25 to $35, include two tacos, dip and a margarita. If customers can guess which type of margarita and tacos they're being served, dessert is on the house. But if you can't even see the dessert, is it still worth it? In addition to the restaurants, plenty of amateurs who accepted the #birdboxchallenge also took to the kitchen. One person who streamed an attempt on Dec. 27, 2018, claimed to be the first. We have to eat, but we can't risk looking at the entities, so we will be cooking with blindfolds on. All we have is the non-perishables we got on our last grocery store run. And one YouTuber became the Sandra Bullock of his own kitchen. He did caution, "Don't try this at home, kids," when chopping the vegetables and said seriously that the challenge is a "great way to develop further empathy for the blind." However, not everyone agrees. The challenge has been met by criticism for its insensitivity to the blind, including by the National Federation of the Blind. Even Netflix had to issue a warning against its fans falling into harm's way. Nonetheless, the show (or dinner ... or whatever you want to call it) will still go on.